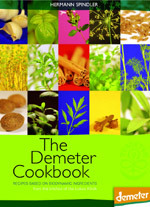 The official Demeter Cookbook presents over 200 recipes, developed and collected by Swiss chef Hermann Spindler, for sauces, soups, hors d'oeuvres, salads, main dishes, puddings and desserts. It also features special recipes for casseroles and gratins, vegetables, quark (curd cheese) dishes, grain dishes, doughs, savoury and sweet pastries, muesli and drinks - interspersed with informative commentary on the value of spices. Since its foundation by Rudolf Steiner in 1924, the international biodynamic agricultural movement has produced high-quality, 'premium organic' food that is increasingly sought after and respected for its flavour, quality and nutritional value. The Demeter brand certifies that the product concerned has been grown and processed using verified biodynamic methods. Hermann Spindler has been head chef at the Lukas Klinik for many years, where his kitchen has gained an outstanding reputation. Alongside food preparation methods that conserve nutritional value, imaginative presentation of dishes and freshly prepared meals, the special nature of the Lukas cuisine is based on the careful selection of Demeter foods, local sourcing where possible, and seasonal use of ingredients. A selection of Spindler's delicious lacto-vegetarian, wholefood recipes - based on the core principles of anthroposophic nutrition - are collected here in an easy-to-use presentation. HERMANN SPINDLER was born in 1954 in Schwaebisch Gmuend, Germany. After first working in the metal industry, he retrained as a chef. Working in various locations in Germany and Switzerland, he finally came to the Lukas Klinik in Arlesheim, where he has been for more than 15 years. He gives cooking classes in Switzerland and Italy, and runs an apprenticeship course at the Lukas Klinik.